There have been reports of some iPad users having massive battery draining issues after updating to iOS 7. iPads affected by this issue will last no longer than a day. The issue does not have to do with leaving the wifi or bluetooth on, in fact it is much simpler than that. 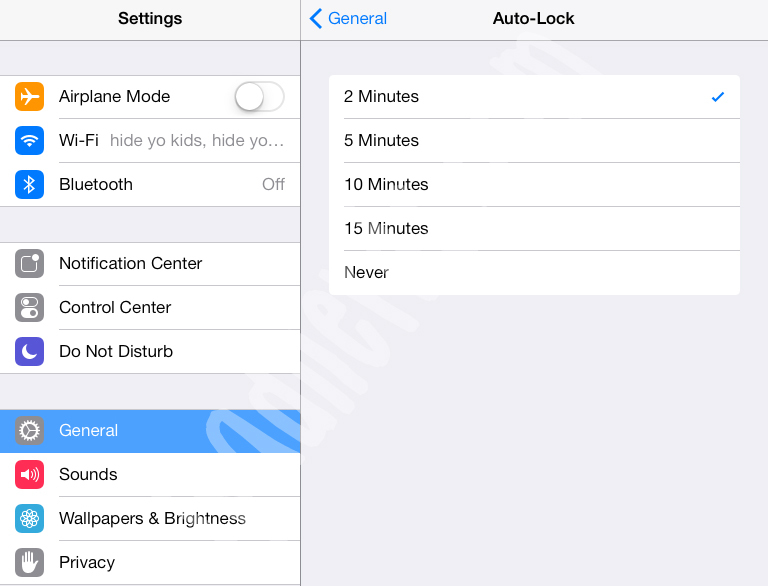 On some devices after updating to iOS 7, the Auto-Lock option gets changed to Never. That means your screen is always on. It may look like it is off, but in fact it just dims after a certain amount of time if left a lone. 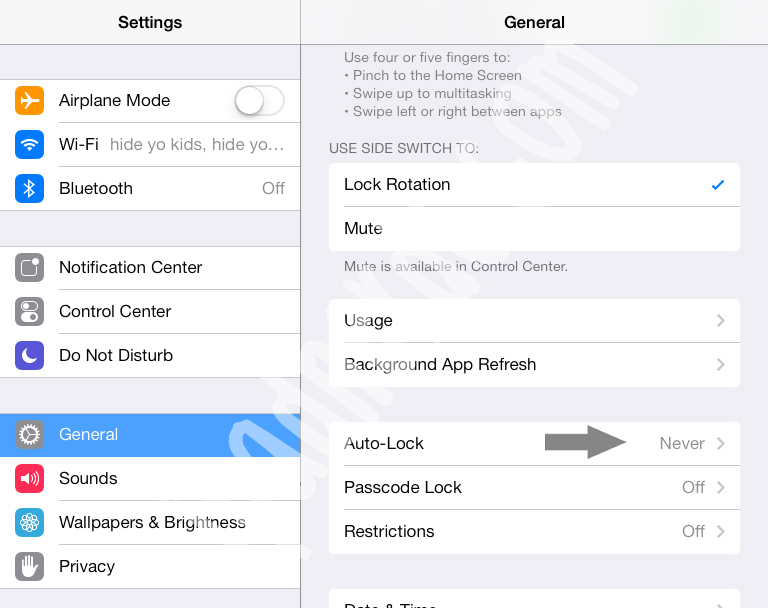 You will need to change the Auto-Lock setting to fix the issue. Thanks. I had massive power loss. Not sure if it was on before because I just did a full reset, and this setting was at 15 minutes. It’s now at 2 minutes. Here’s hoping that it works! Same problem. Battery completely drained 24 hours after installing ios7. Changed Auto-Lock from NEVER to 2 MINUTES as recommended. It works – so far. Follow-up to yesterday’s comment. Solution to the flat battery problem is spot on. Battery usage now normal. Thanks a million. You’ve saved me a trip to the Apple Store! Am going to try this. Hopefully it will save me a trip to Apple store. Am going to try this too – and hope it will work for my ipad. Thanks! Hi! does anyone had some follow up on this solution did it worked???? Both the initial iOS 7 upgrade and the subsequent update enabled Bluetooth when I had it turned off before.mit took me a while to notice and turn it off again, which slowed the battery drain noticibly. After reading this, I checked to see if my auto-lock was off, and it was already on 2 minutes. I’m very confused why my battery drains so quickly!! I use it for school, and it barely lasts a day. Wow thanks. Such a simple thing to correct. Saved me a fortune. Was panicking I would have to take to store and be charged. Thank you sooooo much. Hooray! ….giving thanks for finding your excellent guidance. Tried suggestions and still massive drain on new ipad mini. Used to last days but after upgrade it will drain from 100% to 0 within 2 hours with little use at all. Something I’ve noticed is that it charges much faster too. Will go from 0 to 100% in about 30 minutes. I would try to calibrate the battery. Run the device until battery has drained and the devices shuts down itself. Afterwards, recharge the battery until it is fully charged and then reset the device. I finally determined that the battery drain on my iPad must be due to change in ios7 handling of bluetooth interface. To prevent the drain, I turn off the bluetooth interface every time I set aside my iPad. Haven’t had a dead iPad since. Before doing this, my iPad would typically drain battery to 0 nearly every night.